If you were to group every type of sales career into two buckets, the buckets would be B2B and B2C. B2B stands for "Business to Business," and B2C stands for "Business to Consumer." While not all sales careers are exclusive to one of these buckets, many are, and understanding the uniqueness of each is important for those interested in either starting a career in sales or are exploring a career change. In general, companies engaged in B2B sales work directly with other businesses who may need the products they produce or services they render. Most B2B sales companies have on-staff sales teams or may outsource their sales efforts to independent sales professionals. Those in B2B sales enjoy the benefit of "normal" working hours, a targeted list of business prospects and usually some representation in "market-specific" networking groups. The main drawbacks for those in B2B sales are limited prospects, competition and their livelihoods are often heavily affected by the economic climate of the industry they sell to. Imagine a B2B sales professional who focuses on selling heavy equipment to the manufacturing industry. With the decline in US-based manufacturing, his job security is probably not high on his list of "things I love about my job!" As far as the drawback of limited prospects, the more industry-specific the product or service that a B2B sales professionals sell to, the fewer number of potential customers she has. For example, a sales professional who sells synthetic liquid designed to decrease engine wear in 10 valve diesel engines is limited to selling her product only to those in the 10 valve, diesel engine market space. Sell something like commercial light bulbs and your prospect list is probably endless. For those in B2C sales, everyone is a potential customer. Unlike B2B sales, where sales professionals only focus on selling to other businesses, B2C sales professionals sell to anyone who may need, benefit, want or has enough money to purchase their product or service. The list of B2C sales careers is practically endless, with the more popular ones being auto sales, home sales, home computers, and investment vehicles. While not all B2C products are geared with everyone in mind, the most successful products or services have "broad appeal." It means that many people would be interested in owning/using the product. The narrower the appeal, the less potential for sales. With B2C sales, the most effective way to increase or decrease the scope of appeal is the pricing model. If you want to make ownership somewhat exclusive, assign a price tag that is beyond the reach of the average consumer. If you want to get your product into as many homes as possible, lower the price as far as you can to make your product affordable. Choosing between a career in B2B or B2C sales comes down to where a professional feel they can find the most fulfillment. Both have benefits, and both have drawbacks. And while these two sales career categories are not always exclusive, most sales professionals do focus to either B2B or B2C. The sales cycles are similar as is the need for hard work and dedication. 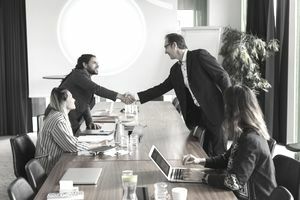 Those who are the typical "people persons," and who enjoy working directly with people may do better in B2C while those who would rather engage on a more professional level will probably choose and flourish in the B2B sales world. Both of these skills will be used in both B2C and B2B but each will be used to a higher degree in either of these sales career fields. In the end, it comes down to the sales professional's personal ​goals, objectives, income needs and passion.